The Women’s Business Symposium is designed for women business professionals, executives and business owners to Learn, Connect & Grow. The program began more than 10 years ago in California. 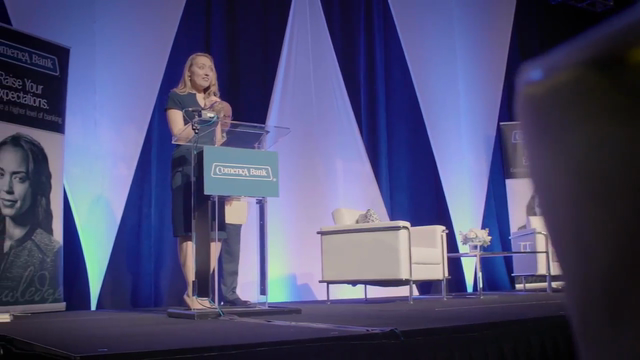 The sell-out success of the event prompted expansion to Comerica’s other markets, giving women professionals more opportunities for valuable leadership development content and enhanced networking. Now, events are held each year in Southern California, Detroit, Houston and Dallas/Fort Worth. For more information on the Comerica Bank Women's Business Symposiums that are open to the public, visit www.comerica.com/wbs. Cookie Johnson is a devoted philanthropist, on the Board of Directors for the Magic Johnson Foundation, and a passionate spokesperson. Cookie is founder of CJ by Cookie Johnson, a premium denim line. Now a New York Times Best-selling author of "Believing in Magic." The Michigan State University graduate lives with her husband Earvin "Magic" Johnson in California; she is mother to their three children, André, Earvin Johnson III (EJ), and Elisa. Geena Davis is an Academy Award winning actor, film producer, writer and founder of multiple women's initiatives. Earning the 2006 Golden Globe Award for her portrayal of the first female President of the United States in ABC's hit show "Commander in Chief." In 1989, Davis received the Academy Award for Best Supporting Actress for "The Accidental Tourist." She was nominated for an Academy Award and Golden Globe for her performance in "Thelma & Louise." Davis went on to receive a Golden Globe nomination for Best Actress for her portrayal of baseball phenomenon Dottie Hinson in "A League of Their Own." Davis is the Founder and Chair of the nonprofit Geena Davis Institute on Gender in Media, which engages film and television creators to dramatically increase the percentages of female characters – and reduce gender stereotyping – in media made for children 11 and under.